Secure electronic document delivery has proven to be an ideal solution for B2C organizations with large customer bases. However, more and more B2B organizations are also reaping the benefits of going paperless. B2B organizations with small customer bases, but high levels of reporting, are excellent candidates for converting paper processes to email. Email is fast, secure and considerably more cost effective. The benefits include improved security; cost and time savings as well as process efficiency and environmental benefits. Business customers will also benefit from being able to easily browse, find and print saved documentation, while documents stored electronically can be effectively backed-up. A great example is the fleet management industry which has a particularly detailed reporting requirement – often supplying “phone book” sized report packs to clients every month. This equals huge printing expenses; paper wastage; logistical problems; courier expenses and storage issues at the client. Some of these reports are typically not required until there is a dispute, which means that many are stored, but never used. Secure electronic document delivery is designed to replace paper documents with fully navigable electronic versions that are easy to use and store. Instead of delivering a vast amount of pages every month, an email is sent with an encrypted attachment (passwords are optional). The attachment contains a ‘mini-website’ which the customer can browse through to find the required report. The email can include PDF formats of the documents that need to be print-perfect. Another successful feature that works very well is an index for the masses of low level reports; these PDFs can be emailed directly to the customer on demand. This dramatically reduces the size of the outgoing report. 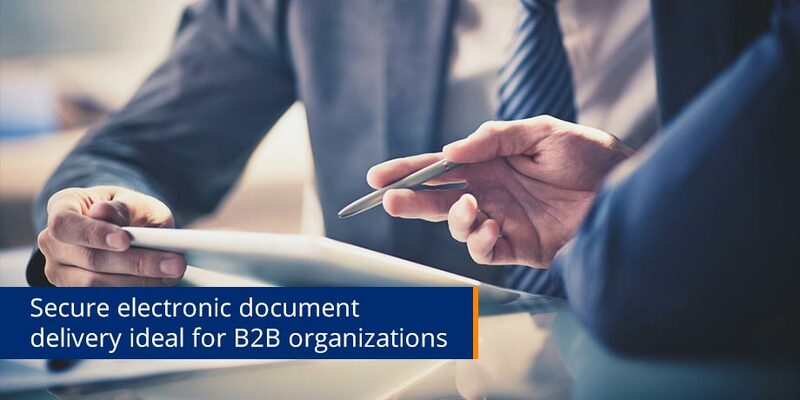 Secure electronic delivery for B2B organizations can also include statements, bills, invoices, collection notices, policies, letters, contracts and regulatory compliance documents. All that is required is an email address, which most business recipients are likely to have. Many organizations prefer to receive documents electronically, as it is easier to track, store and process them. A solution that offers simpler, more secure and manageable processes, while reducing carbon footprint is a highly attractive option for any business.